The Bureau of Labor Statistics (BLS) released the August inflation numbers today and for the third straight month inflation is lower. The annual inflation rate for the 12 months ending in May was 2.13%. The June inflation numbers were 2.07%. In July inflation fell to 1.99% and in August it was down to 1.70%. As the inflation rate falls this is “disinflation” on an annual basis although July and August were “deflationary” on a monthly basis, i.e. each monthly number was below zero at -0.04% and -0.17% respectively. 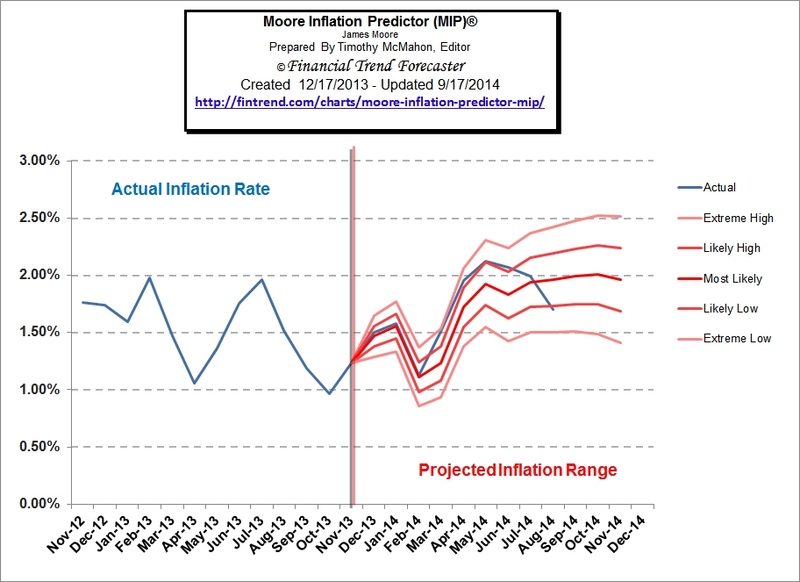 Our Moore Inflation Predictor (MIP) is generally quite accurate. Last month the MIP forecast a slight decrease in inflation for August but we actually got a bit larger 14.5% reduction as inflation fell from 1.99% in July to 1.70% in August. The MIP had projected an extreme low of only 1.81%. This month’s MIP is projecting that inflation will be down slightly for September with a flat to upward bias through the year end but since the 4th quarter is often deflationary we will see greater declines than projected unless the deflationary forces came early this year. 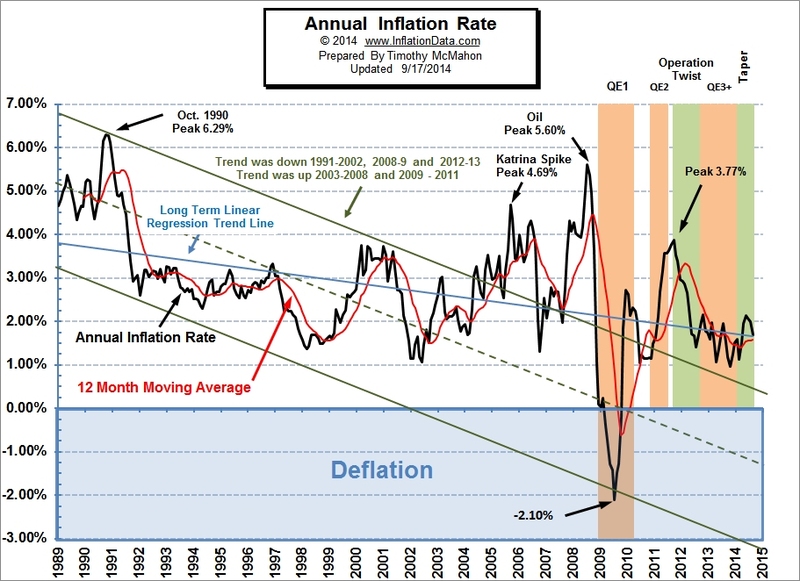 The median line is projecting a possible slight decrease from current levels with 1.66% inflation rate by November but a deflationary 4th quarter like last year could drive inflation down to 1% by year end. Here is a sample of how well the MIP performed. This chart is the projection from December 2013 with the blue reality line extended through the current data. The CPI index was 237.852 in August which was lower than the 238.343 in June and 238.250 in July so on a monthly basis prices fell. That is deflation on a monthly basis i.e. monthly inflation was -0.17%. Actually, prices are lower than they were in May when the index was 237.900 but above April levels of 237.072. This is sort of like the Walmart commercial “We’ve rolled back prices” to the May level. Monthly deflation generally occurs a couple of times a year but is generally limited to the 4th quarter. This year monthly deflation has come early and if it continues throughout the 4th quarter, it could wipe out most of the inflation for the year. The major factor pulling down overall prices this month was the energy sector. Energy on a “seasonally adjusted” basis was down -2.6% for the month of August. Gasoline was down -4.1% during the month. Airfares were down -6.2% for the month.